Welcome to the NBA Live 06 portal! 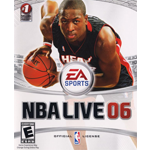 This is a central hub for all the NBA Live 06 content here at the NLSC including news, reviews, feature articles, downloads and more. Andrew's first contributions to March Modness 2019 are a couple of title screen updates for NBA Live 2005, 06, 07, and 08!